What is higher education? Well, higher education is considered the last step in formal education. It follows the achievement of a high school diploma and generally involves the completion of a degree. 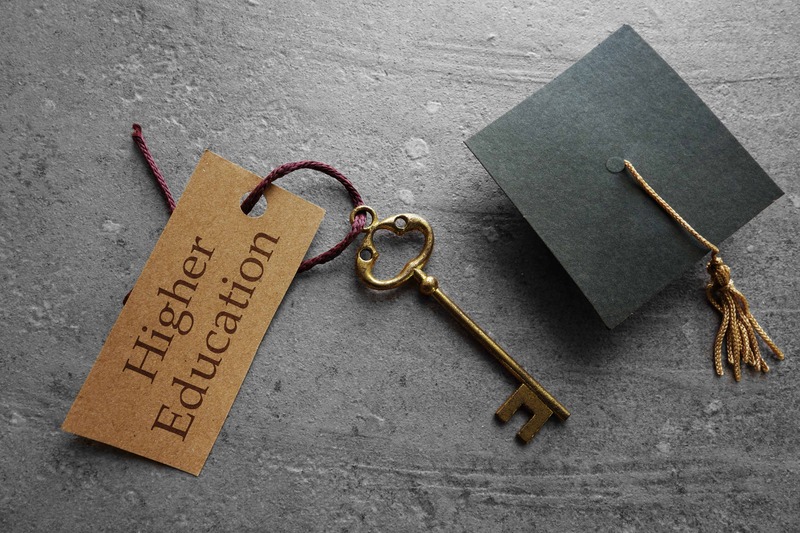 Most recognized definitions explain higher education within the confines of a college or university that awards degrees, and in some cases, certifications. Questions over the efficacy of a college degree continue to challenge the higher education community. Is it really worth the investment? A college degree is expensive. There’s really no way around that fact. If you cut away the population of students who are going full-ride, you still have a substantial number of degree-seekers who will come out of college with insurmountable debt. It’s a terrifying fact that many use as reasoning not to pursue a degree. But, let’s take a step back and think about college education as more than investing in a future job. Instead, let’s think of it in terms of what it affords — an opportunity to transform. Let’s start with the obvious — there is a serious wage gap between those with and without a degree. And that gap is projected to grow. In fact, a collective study by the Center on Education and Georgetown University found that people who hold a bachelor’s degree and work full-time earn 84% more in their lifetime than those with a high school diploma. People with a college education also enjoy other benefits like health and life insurance, both of which lead to a longer lifespan. Thus, when evaluating the ROI for a college education, it’s important to look at the big picture. Over a lifetime, those with a degree simply earn more — whether that is money, benefits, or both. The job market is changing dramatically to match the growth of artificial intelligence. As technology becomes smarter and more sophisticated, companies are able to filter out certain roles in favor of automation. This means that jobs are changing. Roles that used to rely on human interaction are being replaced with artificial intelligence. The job market can be very tough, and companies are actively looking for candidates with well-rounded educations. It’s not enough to have a degree in engineering or math. Employers want their candidates to be well-spoken with strong proficiencies in communication and writing. They want employees who can deliver on their chosen disciplines, while also presenting impeccable soft skill knowledge. They want to see an engineer who has taken a couple of years of French, and they delight in finding a math major who minored in public communications. It seems like a lot to ask for, and it is. But, the reasoning for this is actually quite simple. Companies want candidates who have a breadth of knowledge — knowledge that can serve them in any challenge. The strongest candidates are those who can demonstrate a robust repertoire of college classes, across several disciplines and structures. A college education enables students to build this complex list of skills. Higher education isn’t just about earning a degree. If we step back and examine what a college experience entails, we can see that it is more than just attending classes and taking exams. In fact, higher education is about learning new ways of thinking and acquiring problem-solving skills. Students are asked to reason outside of their comfort zones. They are taught to engage in critical thinking as both an individual and as a member of a classroom. In many cases, students are required to stretch their imagination in both oral and written works, often presented in front of their peers. In other words, a college education teaches students to think differently. Outside of earning a degree, a student will graduate with new and improved skills in critical thinking, analytics, written and oral communication, and group problem-solving. One of the more obvious benefits of a college education is the opportunity to study abroad. Though not always compatible with every degree option, most schools with strong abroad programs are flexible in helping students pursue international study. We could dedicate a whole article to the benefits of studying abroad, but the most important takeaways are increased experience in global education, independence, language proficiency, and cross-cultural learning excursions that enhance classroom instruction. Study abroad ranges in duration from a few weeks in the summer to an entire year, and many institutions offer special pricing for their programs. In some cases, an institution will have an established program abroad, that allows students to study at the same price of tuition as in their home campus. It is rare to have that kind of opportunity outside of a college education. Today’s colleges and universities are investing a lot of time and energy into immersive and experiential learning opportunities. The future is hands-on! Students learn best when they have outside experiences to augment classroom instruction, and immersive and experiential learning takes students into real-world settings like practicums, hospitals, and internships. Within these professional environments, students can practice the theories they learn in the classroom. They are also given new responsibilities that, on a smaller scale, match the work environment they are interested in. Finally, students can use these experiences to test their interest in their passions. Sometimes, an internship or practicum is all that a student needs to realize they do or do not want to pursue their chosen field of study. Some colleges and universities allow undergraduate students to engage in research opportunities independently or alongside a professor. This is a huge benefit to students who are looking to gain some experience before pursuing a master’s degree, where research is almost always a requirement of the program. In other cases, some schools actually require their undergraduates to complete a capstone or final thesis as a component of graduation. No matter what the circumstance — even if not conducted for the purpose of graduate school admittance — research teaches valuable skills in project management and writing etiquette. This kind of experience is very attractive to employers who are looking for evidence of dedication and personal discipline. It cannot be overstated that alumni play a major role in the future of higher education. They give back to their communities, they provide gifts to their institutions, and in many cases, they offer up a network for students who are looking to land a job after college. A strong alumni network can go a long way in the job search, with many alumni eager to help recent graduates find an opportunity within their field of study. Some institutions even invite their alumni to come back to campus and act as panel members for upperclassmen. Students are given the chance to ask vital questions about their industry, while alumni can offer up advice, information, and even networking opportunities. People with a college education are more likely to get involved in their community. It is also true that a degree informs on more than just one’s major. Higher education explores complex issues regarding health, the environment, business, and politics. When students are educated to examine multiple issues, across several industries and disciplines, they learn to assess today’s problems from an interdisciplinary point of view. It is that very skill within higher education that equips graduates to be more active community members and smarter voters. If we think of earning a degree within the traditional undergraduate track, we can consider a college education to be an important phase of independence and problem-solving. Undergraduate students are inundated with pivotal changes, many of which take place outside of the classroom. Students must learn how to manage their time, how to deal with new people and roommates, how to talk to their professors, and how to navigate their new, social settings. Most importantly, students must gain the independence to make these decisions on their own. A college education is so much more than tackling new challenges in the classroom. It’s about learning how to manage new-found independence in a way that is practical and safe. Some high schoolers know what they want to study in college. For those lucky few who have found their passions early in life, a college education is a necessary means to an end. For many other students who are on the fence about their chosen field of study, there is hope. A college education affords individuals the opportunity to discover their passions. Most schools do not require their students to commit to a major right away, allowing for some freedom to explore different options. In fact, many first-year advisors strongly encourage their students to take as many interesting classes as possible. Institutions know that most incoming freshmen will encounter some confusion when it comes to selecting a field of study, so elective courses are offered up as a way to explore possible interests. Colleges and universities are big on promoting extracurricular activities to strengthen resumes. They sometimes refer to this as an “activities resume.” Companies want to see that candidates spent their college days doing more than just studying. They want to see evidence of leadership and participation in clubs and organizations. A college education allows students to get involved in these extra-curricular activities. So, even if a student is pursuing a degree in computer science, they can still demonstrate leadership experience by serving as a committee member for their fraternity or sorority. Students can also show off their participation in language clubs, community-service organizations, or simply groups dedicated to a certain passion. The world is changing. Technology is developing beyond our wildest dreams, and complex issues in business, environment, and politics continue to challenge our society. Higher education prepares students to meet these challenges with grit and determination. A college education is more than classroom instruction. It is a holistic journey that explores facets of individuality, perseverance, and skill. A degree is about learning how to think, communicate, and deliver. More realistically, it can be considered as a transformation — from potential to realization. Are you ready to earn your degree? Check out our undergraduate and adult programs, today!